Painting Acrylic on Mount Board | 15" x 13"
Painting Acrylic on Mount Board | 30" x 26"
Painting Acrylic on Mount Board | 25" x 15"
Painting Acrylic on Paperboard | 15" x 25"
Painting Acrylic on Paperboard | 26" x 30"
The vivid colours of nature dominate my palette, especially tones of green. My paintings on canvas are the true evidence of my earnest affection towards the bounties of nature. Greenery, without any exceptions, is soothing to everyone’s eyes and thus; I intend to deliver the same effect through my paintings. Other than green, purple colour is also frequently used in my works along with hints of yellow, orange, blue and brown. One cannot imagine nature without the presence of these colours and so as to bring out the actual image of the nature I use these colours just in the right amount. 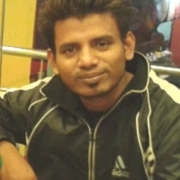 Palash is an Indian freelance artist who was born in West Bengal. Currently working as a drawing teacher in Bangalore, he works in Acrylic medium on paperboard. Academically, he earned Bachelor of Visual Arts from Government College of Art and Craft and subsequently, completed his Master of Fine Arts from Viswa Bharati University. Since 2014, Naskar’s artistic finesse has been showcased at various annual exhibitions in Kolkata and Bangalore. He was honored with the prestigious Sudhanshu Bikash Roy Award in 2008. Moreover, he had been invited to preside as a judge for a national level drawing event at a prestigious institution in Tamil Nadu.